These square shape rigid gift boxes are made from 1200g high quality paper board,covered by art paper and matt lamination,feature with ribbon bow and hot stamping text,lining with designed art paper,coming on 3 size and 4 colors. size 1) 4 x 4 x 1-1/2" 2) 6 x 6 x 2-1/2" 3) 8 x 8 x 3-1/2"
Gift Boxes have so many variety including rigid boxes,foldable boxes,pop up boxes,gable boxes,and more.Those gift boxes can fit any requirement for packaging products and gift items to cover different cost range.OF course if you want unique,nice looking and strong protective gift boxes, rigid boxes are the best choice,No matter where you search gift boxes,those boxes that can attract your attention are rigid boxes.As gift boxes manufacturer, Gift Box Shop specialize in manufacturing those rigid gift boxes with different shape and design to fit your need at unique gift packaging. Our rigid gift boxes have different shape such as round,heart,square,rectangle and more,those rigid gift boxes come in many sizes,colors and designs. 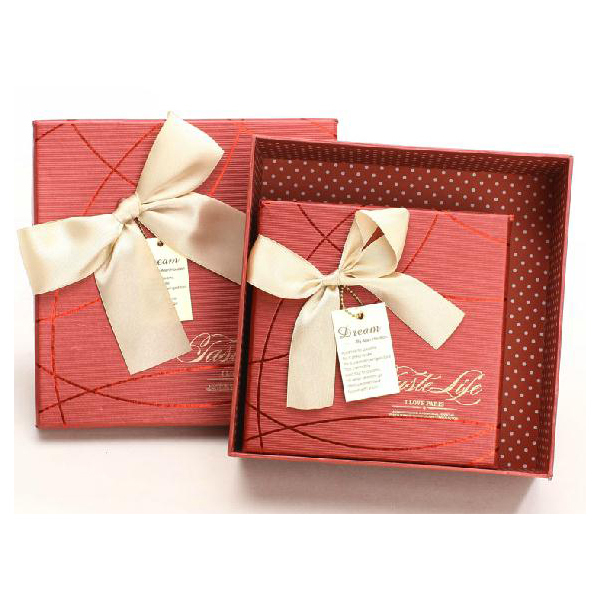 The benefit to choose rigid gift boxes at www.giftboxshop.org is to get great price and professional service. Custom logo can be printed on boxes by hot stamping to create personalized gift boxes for business or event,it it the fastest way to get customized gift boxes at the cheapest price.Contact with us now.